A HI-TECH weapon has been unveiled in the war against mental illness - a free web application for iPad and smartphones created by Hervey Bay man Trevor Boulton. 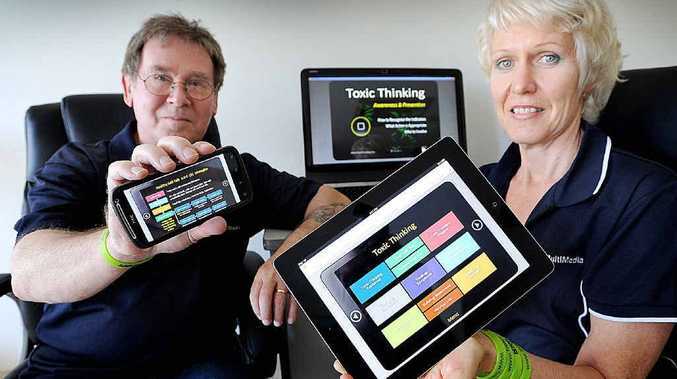 The application helped identify early warning signs of "toxic thinking" and showed people how they could change the way they thought in order to minimise the risk of developing a mental illness. Mr Boulton said the app, which could also be accessed online via a computer, provided information on the steps for people to get help before their problem spun out of control. It also had resources for those who believed their loved ones might need help. "When something bad happens, people may say things like: 'It's my fault, it's going to last forever and it's going to undermine everything I do'," Mr Boulton said. "Others, who are less likely to give in to the tough times, say: 'The outcome was out of my control, it's only temporary and it's only one part of my life'. "By learning to recognise negative self-talk in ourselves and others, and using the tools within the program, distorted thinking can be challenged and professional assistance sought if appropriate." Much of the information used in the web-based application was based on studies by psychologist Martin Seligman who believed individuals could choose the way they thought and alter their mental habits. The program also included Australia-wide referral and support information. The Boultons have spent more than a decade telling students of their own mental health issues and providing information to help them be aware of warning signs. The application was developed in association with the Mental Illness Fellowship of Australia. For more details, visit toxicthinking.info.